With a foundation of the Company’s 30+ years of experience in the fabrication of Shell & Tube Exchangers and utilizing the new CNC machining, welding, strip lining, fabrication and testing equipment that EKME has invested in, the last few years, we are proud to enter the field of High-Pressure Heat Exchangers fabrication. Such Exchangers include all TEMA D or H type, High Pressure Preheaters for Power Plants, in any material grade and size, with design pressure over 130 bar-g.
EKME has successfully carried out the supply of 8 complete DFU/TEMA type Exchangers together with 2 bundles for similar exchangers, to be installed in Motor Oil Hellas, Corinth Refinery’s Mild Hydrocracking Unit. 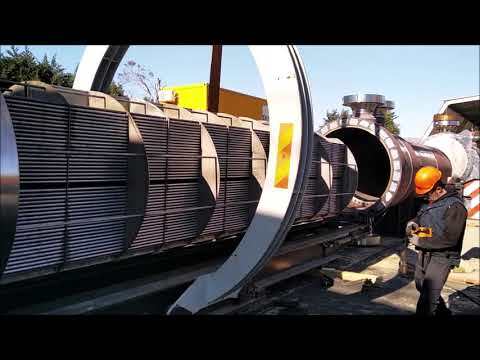 A video presentation of the exchangers’ configuration and characteristics and the fabrication process of these items is available for your information (see above). Supply of 8 DFU High Pressure Heat Exchangers and 2 Tube Bundles for DFU Heat Exchangers to be installed at Mild Hydrocracker Unit at Motor Oil Refinery in Corinth Motor Oil Hellas S.A. Motor Oil Hellas S.A.